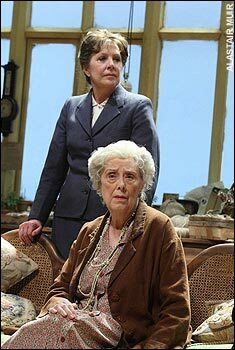 One of Britain’s most distinguished actors, known for her roles on stage and screen Margaret Tyzack, right, as Mrs St Maugham, with Penelope Wilton in The Chalk Garden at the Donmar in 2008. Margaret Tyzack, who has died aged 79, was one of Britain’s greatest and most popular actors, working on stage, television and film for more than half a century. Sometimes described as being in the mould of Edith Evans and Flora Robson, she will be remembered particularly for performances in the golden age of BBC TV drama – Winifred in The Forsyte Saga (1967), Antonia in I, Claudius (1976) – as well as for stage performances such as Martha in the National Theatre’s revival of Edward Albee’s Who’s Afraid of Virginia Woolf (1981), for which she won an Olivier award for best actress, and Lottie with Maggie Smith in Lettice and Lovage (1987 and 1990), which earned her both Tony and Variety Club stage actress of the year awards. In 2008, well into her 70s, she scored perhaps one of her finest triumphs on stage as the wily, wittily eccentric Mrs St Maugham in Michael Grandage’s outstanding revival of Enid Bagnold’s The Chalk Garden at the Donmar with Penelope Wilton. With her open face, broad eyes and generous mouth, there was perhaps always something a little melancholic about her – even pessimistic, a trait she readily admitted to – that found her playing more “mature” roles than her actual years. She once confessed: “I’ve always played older than myself.” It was an asset that served her richly. Tyzack considered herself first and foremost a character actor, asserting that she “never wanted to be a star”. Immensely versatile, unassuming, modest and largely unrecognisable offstage, she often boasted that she could go shopping without being spotted, and lived quietly with her mathematician husband, Alan Stephenson, in Blackheath, south-east London. She could play kind, benign, a pillar of the empire (such as Lady Bruton in Marleen Gorris’s 1997 film of Virginia Woolf’s Mrs Dalloway) or in the latter years of her career, a show-stealing, fur-clad battleaxe in His Girl Friday, John Guare’s stage adaptation of Ben Hecht and Charles MacArthur’s The Front Page (National Theatre, 2003). While there was something endearingly naive about her role as besotted Winifred, and comically understated as the reactionary matriarch in Mrs Dalloway, her depiction of Martha in Edward Albee’s Who’s Afraid of Virginia Woolf displayed a ferocity previously unrevealed in earlier roles that tended towards either the respectable, down to earth, or emotionally obsessive, sad or caring. In her later career, she seemed to acquire even greater force and magnetism with a trio of superb roles in Auntie and Me at Wyndham’s (2003), opposite Alan Davies, Southwark Fair at the National (2006) and The Chalk Garden. She once mused on becoming a nurse. “A fortune teller,” she noted, “used to tell me I had healing in my hands.” She was saved by a “wonderful drama teacher” who came to her school and took an interest in her. She went on to train at Rada, where she won a prize for comedy – forgoing her first choice, speech training, through lack of the required academic qualifications. She then went into repertory in Chesterfield, Derbyshire, where she made her first stage appearance, as a bystander in Shaw’s Pygmalion in 1951. Further work followed at the Royal Court and Nottingham Playhouse. In 1969 she won her first acting award, a Bafta for her role as Queen Anne in the BBC’s The First Churchills. Two years later she took over from Eileen Atkins as Elizabeth I in Robert Bolt’s Vivat! Vivat Regina! at the Piccadilly. The following year, with the Royal Shakespeare Company, she appeared as Volumnia in Coriolanus, Portia in Julius Caesar and Tamora in Titus Andronicus. As Volumnia, she was towering, a terrifying tigress fighting for her son’s life but also reducing Ian Hogg’s athletic warrior general to shuddering, childhood impotence. Tyzack was in the US in 1971, winning another award for her performance in the title role of a television version of Balzac’s Cousin Bette. Then in 1976 came the landmark TV drama I, Claudius, followed by three years at Stratford, Ontario, where she took on roles as Mrs Alving in Ibsen’s Ghosts, Queen Margaret in Richard III and the Countess in All’s Well That Ends Well. If much of the early 1980s saw her exploiting her TV range, she also came even more into her own on stage. In 1983 she received a Tony nomination for her reprised role as the Countess in Trevor Nunn’s RSC production of All’s Well That Ends Well when it visited Broadway, and two years later was again picked out by New York’s Drama Desk critics for her performance as Rose, Viv’s mother, in Tom and Viv, Michael Hastings’s 1984 play about the tortured marriage between TS Eliot and Vivienne Haigh-Wood, when it travelled to Broadway. Some of Tyzack’s best work, however, was still to come. In 1987, she starred alongside Maggie Smith in Peter Shaffer’s quirky two-hander, Lettice and Lovage, a strange, whimsical tale of two women, one a fantasist, the other, Tyzack, a strict traditionalist, who are at first enemies, but forge an odd kind of friendship. With her dry humour, Tyzack proved the perfect foil to Smith’s high camp. The play ran for two years in London before moving to Broadway, where Tyzack received another Tony. Her partnership with Smith was revived in 1993 when she played Miss Prism to Smith’s Lady Bracknell in The Importance of Being Earnest at the Aldwych, a characterisation marked by its originality. For once Prism was no fusty spinster but, in Tyzack’s hands, an attractive and clever woman. Other major roles at that time included the older sister to Felicity Kendal’s adventure-seeking Fiona, reminiscing about her younger sister’s Indian exploits, in Tom Stoppard’s Indian Ink at the Aldwych in 1995, and an imperious Lady Monchensey in Adrian Noble’s much admired revival of TS Eliot’s The Family Reunion, at the RSC (2000), where one critic described her face as “nothing less than a tragic mask when Harry, her pride and joy, relates his ‘unspeakable’ sorrow”. In 1993, she played Sybil Birling in Stephen Daldry’s mould-breaking revival of JB Priestley’s An Inspector Calls at the Aldwych, and in 1996, scored one of her biggest successes in Alan Bennett’s Soldiering On (Chichester Festival Theatre, then at the Comedy Theatre in the West End). Playing Muriel, she conveyed the infinite distress of a woman whose lifetime code of denial was gradually being stripped away. As the almost mute aunt to Alan Davies’s garrulous nephew in Auntie and Me, she was required only to lie in bed, but still managed to convey a wealth of meanings, switching between beatific smiles and nods. In between times, her TV and film work continued to flourish. Two particularly heavy years, 1980 and 1981, saw her appear in seven different television productions, including Paulina in Jane Howell’s adaptation of A Winter’s Tale. In 1987, she appeared as Madame Lambert in Stephen Frears’s film of the ill-fated relationship between Joe Orton and Kenneth Halliwell, in Prick Up Your Ears. She was also Miss Helen Seymour in Paramount’s television series The Young Indiana Jones Chronicles, during the 1990s. Other television series in which she appeared included Miss Marple, Thacker, the dramatisation of Our Mutual Friend, Dalziel & Pascoe and Midsomer Murders. In 2005 she was the narrator’s grandmother in Radio 4’s all-star cast adaptation of Proust’s In Search of Lost Time. Film appearances included The Whisperers (1967), two films for Stanley Kubrick – as Elena in 2001: Space Odyssey (1968) and a conspirator in A Clockwork Orange (1971) – Bright Young Things (2003), directed by Stephen Fry, and Richard Claus’s The Thief Lord (2005). She went on to do precisely that, her last London stage appearance being as nurse to Helen Mirren’s Phèdre at the National in 2009, and her last anywhere as Mrs Higgins in My Fair Lady at the Théâtre du Chatelet, Paris, last Christmas. Illness compelled her to withdraw from a role in the television soap EastEnders in April. In 1970 she was appointed OBE, and in 2010 CBE. She is survived by Alan and her son Matthew. This entry was posted in Obituaries on June 27, 2011 by admin.